For those of you who tuned in late, a few days ago I knitted four swatches of gossamer yarns on size #0 needles and blocked them. I then examined them for visual appeal, as well as a flimsy/dense appearance. I was rather surprised at the results, and, given the answers I received on the last blog post, you guys are going to be really surprised. The Holy Grail Heirloom Gossamer Merino basically flunked this swatch test. Only 1 person picked it as the most visually appealing and 4 people thought it was the heaviest. Thirteen people picked the Yubina cash/silk as the finest (only 2 people liked it best), but it has the exact same NM number (45/3) as the Colourmart cash/silk on the bottom right. Technically both the Yubina and Colourmart yarns are 30% heavier than Heirloom's Gossamer Merino. Note: I had to calculate Yubina's number from the information given on their website, that is, 800 yards/50 grams. I teased apart the yarn and counted 3 plies, ending up with the 45/3 NM value. Ten people, including myself, chose Colourmart's cash/silk as their favorite and 5 people thought it was the heaviest, probably because it is the fuzziest (and softest, too). One person picked Yarn Place's Angel as the heaviest; 1 person thought it was the finest. Five people chose it as the most pleasing. It was definitely the most pleasing to knit--springy and forgiving. I wish Yarn Place would stock more shawl-appropriate colors. 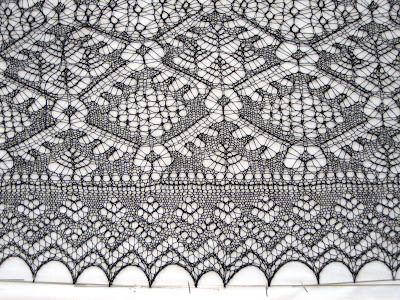 Would anyone knit a fine Shetland shawl in dark gray or tangerine? There's not even any white offered so you can dye it yourself. I whipped out my trusty McMorran balance, which let's you easily calculate the yards/pound of any yarn using just a small sample. (You can read about the balance here.) It is not the most precise tool in the universe--figure within 10% of true, although Siva Harding reports that she got accurate measurements by stretching the yarns slightly as she measured. 1. Apparent yarn weight is more a measure of how tightly the yarn is spun, rather than the published NM number. Both Yubina and Colourmart yarns are 45/3 cash/silk. The Yubina yarn is very tightly spun, the Colourmart yarn is much fluffier. 2. Visual and tactile appeal are more important than published NM numbers. Most people chose the visually heaviest yarn as their favorite and disliked the stringy appearance of the Yubina. (Clearly, the Yubina yarn is so thin that it would benefit, as one reader suggested, from being worked on a #00 needle.) I personally prefer less airy lace--I think the holes appear more prominent set into a dense background. Other folks want their lace as wispy as possible. 3. Yarn selection can start with publishing NM numbers, but the deciding factor shouldn't be how fine that number purports to be. 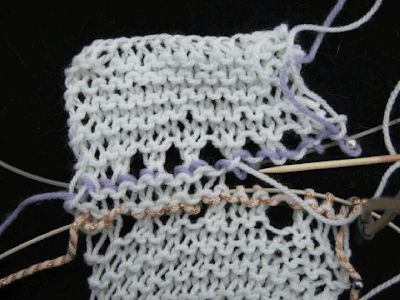 Knit your swatches serially at one sitting and compare them. Decide which yarn you would most enjoy knitting and which one gives the most visually appealing appearance. Keep knitting swatches until the pleasantest knit also looks the bestest. None of these yarns are for beginners, and even advanced lace knitters will find them a challenge. Before embarking on a hyper-complex shawl like Princess, please be sure you are choosing the right yarn for you. You'll be working with it for a long, long time. 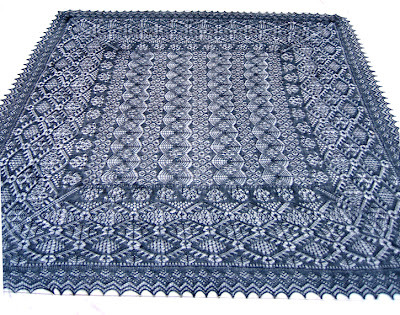 If you have been waiting for the re-release of Heirloom Knitting's famous Princess shawl, you'll be happy to know that it's out and you can buy it here. Although the first release was a limited edition of 250, I could find no such restriction placed on Princess 2.0, so you can probably request it for a Christmas present. At $40, it's a bit expensive, but worth every penny. Until the pattern actually arrives here and I can knit an actual sample repeat, I have to be content fooling around with yarn and needle combinations. And of course, there was plenty of fooling this weekend. The Swatch Party gave me a chance to try out my brand-new KnitPicks Harmony needles. Whoops...one of them broke during swatching. I couldn't believe it--I mean, it's not like yarn this fine can put a strain on the wood. The tip just snapped clean off at the metal collar. In addition, they were so ugly--my goodness! Green, yellow, magenta--hideous with bright red yarn, loathsome with pink, and revolting with blue. I did things a bit differently this time. I put all the Major Contenders--yarn and needles--on the table and knit the samples sequentially without stopping. This process gave me a better idea of which yarn really handled the best, and which needles were the most appropriate. The results were a bit of a surprise to me, and might be to you, as well. 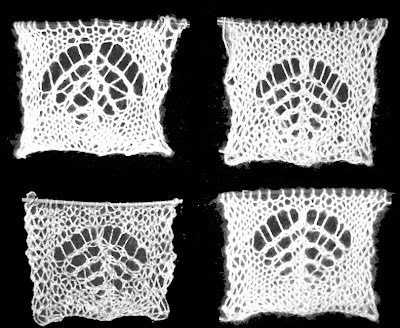 Below are four of the worked samples, presented in grayscale only to eliminate color preferences. For two of these swatches, I ran out of sample yarn before I could finish the garter-stitch rows at the top of the pattern, so two of the samples are a bit shorter than the other two. Here's the quiz. The samples range from 11,000 to 7,000 yards/pound, that is, the finest is a 48/2, the heaviest is a 45/3. Can you tell which is the finest and which is the heaviest? And which one do you prefer visually? Of course, then we would have to knit a battery-pack cover to power this yarn. The concept gives new meaning to the sentence: "That sweater is a turn-on!" Wonder how many colors it comes in. Grafting for Dummies Continued--With Pictures! Okay, here we go for the folks who couldn't picture what I was talking about in the last post. Let us recall that I suggested you select a simple row in your border pattern as the one you will both begin and end with. The reason I said to do this is because the graft you will create replaces both these rows with a single row. 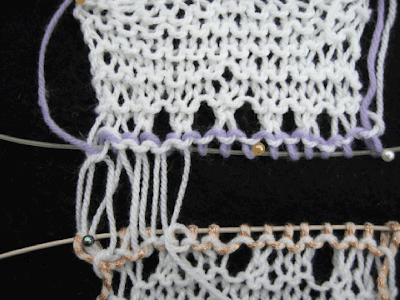 Here we have the two ends of a border that was knit around the edge of a shawl. I am afraid that you will have to imagine a shawl connected to the right side of these two edging bits. Much as I love my readers, I refuse to knit an entire shawl to illustrate this process. 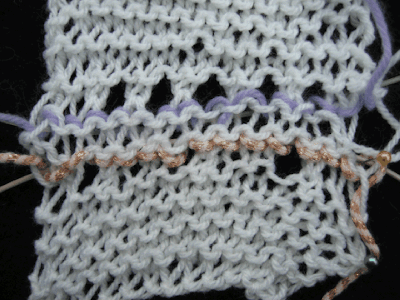 The border segment on the top is the beginning of the edging. I knitted the last row (labelled row 578,985), first. Please note the "5" at the end of the number. It was knitted in purple waste yarn. This is the row that I decided would be the final row of the border. I chose this as the simplest row in my border repeat. I then knitted the rest of the border, carefully calculating repeats so that when I finished the entire border, I was back at the same row I started with, which, as you recall, is row 578,985. On the bottom, you see the end of the border. Row 578,985 is knitted in pink. 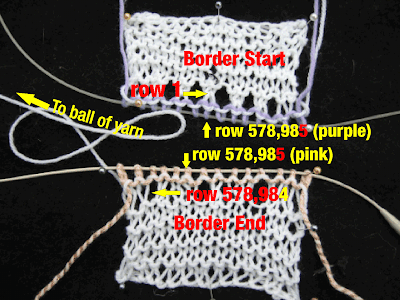 Note that the ending segment is still connected to the ball of yarn with which you knitted all 578,986 rows. That is, 578,985 rows plus the extra row you knit at the beginning. 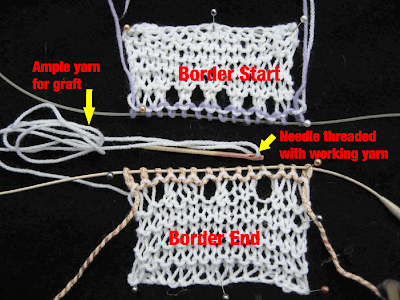 When you do the graft, you will be following the paths of the two waste yarn rows. Instead of going around the needle, you will be making a continuous path between the two segments, ending up with a single row 578,985 that is the graft. To see really big pictures, click on the smaller ones shown in this post. I positioned the end and beginning segments arbitrarily. You can flip everything over or rotate everything 90 degrees. It doesn't matter. You do not need to identify purls, knits, or yarnovers. Be incredibly careful that you run the needle cleanly through each stitch. Do not catch the waste yarn with the needle! If you do, you will not be able to withdraw the waste yarn. Also be incredibly careful not to catch any strand of the live stitches with the grafting needle. I will, unfortunately, show you what happens if your needle catches other threads. Leaving a long length of yarn to perform the graft, detach the working yarn from the ball. The usual amount given is 4 or 5 times the width of the graft. If you are nervous, make the length 10 times the width of the graft. 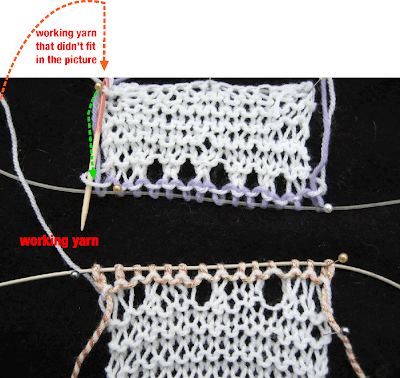 You can always make it shorter, but it's not so easy to make it longer if you run out of yarn before you have completed the graft. Thread the working yarn into a needle. Examine the picture below for a sec. The white working yarn is partially out of the photo. The orange dotted line shows where it would have been if I hadn't cropped the photo so closely. 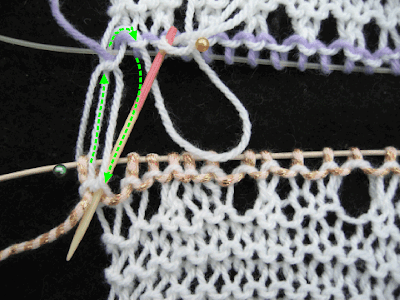 The green dotted line is following the purple waste yarn as it goes through the white stitches. Notice that the needle is also following the green dotted line that is following the purple waste yarn. The purple yarn now goes around the upper needle, as its current job is be be a live knitting stitch. Knitting stitches go around knitting needles. You can cogitate about this concept later, but now, it's time to do the first stitch on the lower needle. 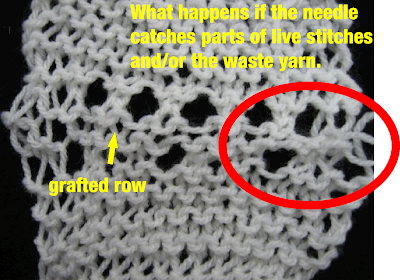 As above, the orange dotted line represents the working yarn and the green dotted line is following the path of the pink waste yarn as it wanders through the live stitch on the bottom needle. We see that the pink yarn then goes around the lower needle, so it's back up to the upper section with the grafting needle (whose job is not to go around knitting needles, but between them). 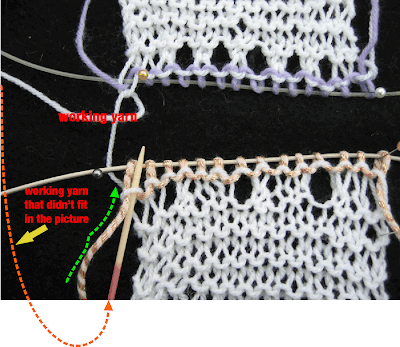 The photo below shows the working thread going up to the top fragment, following the purple waste yarn back down, and then entering a stitch on the lower needle. If you are actually following along, you will suddenly discover that each grafting stitch enters each live stitch twice. Now we follow the pink waste yarn down through the live stitch, across to the next live stitch, and up through that. Notice how the white working thread follows along the paths of the pink and purple waste yarns. Here's a picture with the working yarn snugged up a bit. The row is done. All that's left is to remove the waste yarn and knitting needles, then adjust the tension of the grafted stitches. Here's the finished product, complete with an example of what not to do. Notice that when I pulled out the waste yarn, it I completely ruined the tension of the stitches on the right. That's because the grafting yarn caught a bit of the waste yarn, so when I yanked on it, thrilled to be finished with this exercise, some of the graft squirrzled as it tried to follow the waste yarn home. Oops! It's not so difficult to fix, so don't panic. Or, panic if you want to, then come back and readjust the tension of the grafting yarn. And now, go have an entire box of cookies! Before I started the Spider King edging, I spent hours reading all about how The Experts Did It. Line up bumps, Line up Vs. Go up through the first stitch, down through the fourth one on the third needle purlwise, being careful to maintain an even tension, clean your glasses, turn off karaoke machines, and so on. Deciding to follow one particularly detailed explanation, I carefully knit a full repeat in a different-colored waste yarn, then knit another row in a differently colored waste yarn. At the end. I spent 20 hours trying to figure out what the heck all those waste yarns were supposed to be grafted to and in what order. Ultimately, knitting the first repeat was not only a waste of time and waste of waste yarn, but turned out to be so confusing that I finally just snipped it out. I put everything aside and spent some time with more waste yarn in a different room than the original waste yarns, shawl, needles, glasses cleaners, and Xanax. 1. 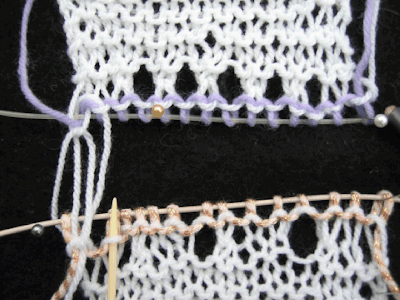 When you are ready to begin the edging, chose a simple row as the ending row and knitted it first with waste yarn. 2. 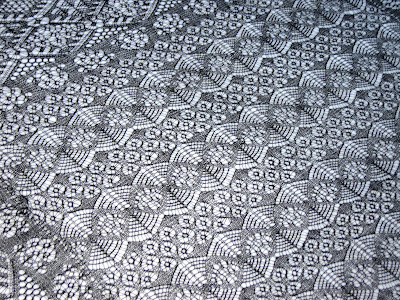 Knit the border and then knit last row again with waste yarn. Using a different color from the first waste yarn will make step 3 easier. 3. Follow the path of the waste yarns with a blunt needle threaded with a nice, long length of the working yarn. 1. Inspect your edging repeat and choose the simplest row. In my case, every other row was plain knit, so selection was a no-brainer. My border had peaks and valleys. I chose the knit row at the bottom of the valley. 2. This row is both the starting row and your ending row. 1. Take a piece of waste yarn in a contrasting color and work the chosen row. You are knitting the last row of the border first, yes you are. 2. Then continue knitting your border with your real yarn. 3. Time passes. For some of us, it's a lot of time. 4. When you get to the end, knit the last row in a contrasting color waste yarn. Using a different color from the first row will be helpful. 5. You will notice that, having finished the shawl, the edging is still connected to the yarn ball. 6. Sorry, but you will have to break the connection--but leave yourself a nice long piece to do the graft. 7. Thread the end into a blunt needle. 8. 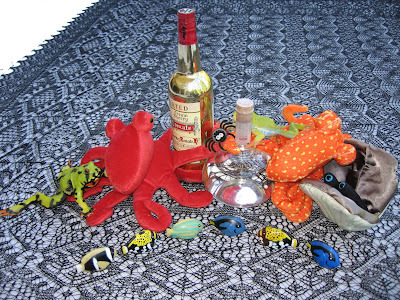 Give the shawl and the threaded needle to a Boy/Girl Scout who can follow a map. 9. Explain that he or she needs to follow the path of the waste yarns. If the working yarn is on the bottom needle, then the working yarn must go up to the other needle, follow the path of the upper waste yarn as it meanders through the live stitches, until the waste yarn starts heading back down to the knitting needle. At that point, the working yarn moves back to the bottom needle and follows the waste yarn until it heads back up to its knitting needle. It doesn't matter which side you start on, or whether the shawl is facing up or down. There are no bumps or v's to line up. You don't need to understand knitwise or purlwise. You don't need to drop stitches from needle. You can go get a cold drink and come back when the Scout is finished. 10. 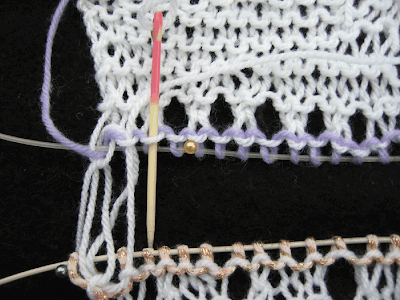 Remove the knitting needles, slide out the waste yarn, and adjust the tension of the grafting yarn if necessary. Don't forget to give the Scout a cookie. You've all been so patient, waiting for me to finish this monster. When I finally discarded the convoluted, inaccurate grafting instructions I found on the Web and substituted a simple "follow the leader" process, the final step took ten minutes. I won't clutter this post with my moronic instructions, but I'll do a really short post in a day or two to show you what I did. For those who tuned in late, the project started off as Hazel Carter's Spider Queen. Well, the first thing I fiddled with was the color, changing the boring white to dramatic black. Then I had some difficulty with the chart for the central square, so I fooled with that too, ending up with something sort of similar. I motored right along to the the inner border, which I didn't care for, so I discarded it and designed one featuring bouncing baby spiders. At this point, I kind of decided that the original pattern pamphlet was probably not guiding me anywhere, so I mutated a Japanese pattern named Mondnacht into the outer border. And of course, I had, by this point, no recollection of the original edging at all, so I dinked about in Excel and created something pleasing that also fit nicely into discrete repeats. I have no idea what the copyright issues might be and the pattern notes are such a mess I don't think I could begin to convey the directions. If anyone is truly desperate for this pattern and is able to improvise a bit, I'll be happy to send along all the notes and charts. Everything is in electronic format in Photoshop, CorelDraw, Microsoft Word, and Adobe Acrobat. 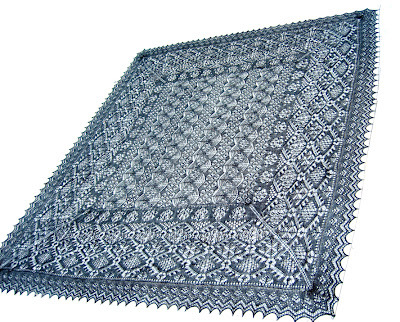 The shawl used about 3000 yards of Yarn Place's Gentle and was knit on #2 needles. It's quite large (about 6.75 feet x 5.5 feet, and 9 feet on the diagonal), so it was difficult to photograph the entire thing. When I have the energy to unpin it, I'll take one of those artsy, swirly pictures that show lacy shawls at their finest. For now, let's take a flatland tour. I couldn't stand far enough away to get the entire thing in the picture frame. Attempts to take meaningful detail photos were a bit of a problem. Of course, everyone decided to party right on top of the darned thing. Daphne, who is now living in Japan, sent a bottle of sake. 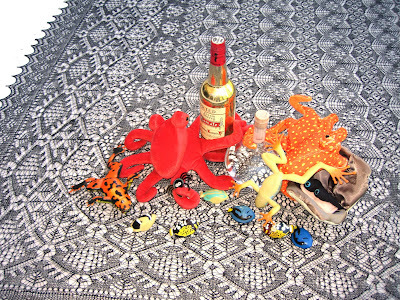 A good time was had by all, although it took me twenty minutes to untangle the octopi from the now-empty sake bottle. 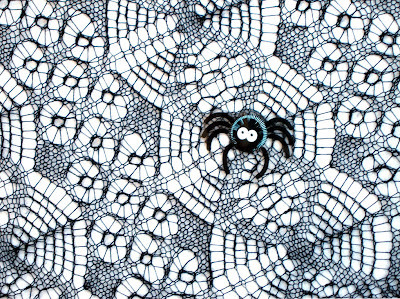 The entire set of photos can be found on Flickr, and I will soon upload a few to Ravelry, as well. The past two weeks have not been, as they would say in Japan, a Positive Experience. I was overwhelmed by the incredible number of readers who took the time to post condolences. Reading these comments made me realize that there are an astonishing number of lovely, caring people out there. Truly, the kindness of strangers has helped me cope with grief, pain, and an acute case of grafting dyslexia. I have been wracking my brain for a way to give all of you a tangible thank-you. No results so far, but I promise to keep wracking until something turns up that will delight all your hearts and minds. If any of you have a bright idea, please let me know. And no, you can't have my stash, husband, cat, or Nieblings. Mind-numbing knitting was just what I needed this week. It took me two months to knit two border edges, and three days to knit the remaining two sides. 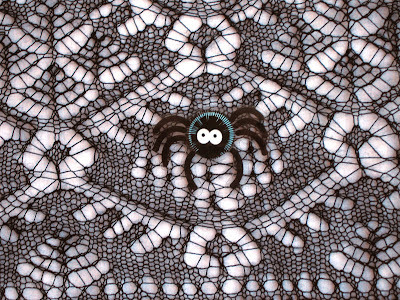 Black Window Spider King is finished and will be blocked tomorrow. I did have a large crash-and-burn at the end, however. After 19.5 hours of trying to follow several pages of meticulously written directions for grafting the two border edges (a whopping total of 20 stitches), I finally realized that the directions omitted the final, important step. As written, the instructions don't work. I will post my one-paragraph-no-pain-no-pictures-needed border grafting method this week, I promise. Even Roy, who has some difficulty distinguishing a knit stitch from an armadillo, can do it. And a last crabby note. I finally received some of the new KnitPicks wooden needle tips. The points, joins, and finish are perfection. But I do not want to meet the person who decided that knitting with purple, yellow, and green needles festooned with magenta cables would be a soothing experience. I confess that my intention, after seeing the catalog pictures, was never to actually knit with these things. Nope. They are merely organ donors. My collection of Holz & Stein ebony double-points will be transplanted into the magnificently engineered connectors, giving me a exquisite set of H&S interchangeables. Never fear, the pop-art needle tips will begin new, productive lives as dibbles, swizzle sticks, and canape skewers. When I was a little girl, my father and I often spent summer afternoons chasing Good Humor ice cream trucks. For those of you too young to remember Good Humor ice cream, let me just say that for a mere 10 cents, you could purchase a little bit of frozen heaven. I recall, with almost painful nostalgia, the Orange Creamsicles and the Chocolate Eclair bars. Daddy and I would ride around town for hours until we cornered a truck and then wasted a pleasant ten minutes debating the pros and cons of Toasted Almond vs. Candy Center Crunch bars. In those days, supermarkets were grocery stores, which meant they were small and not very well stocked. My mother bought this humongous chest freezer so she wouldn't have to go food shopping every few days. Every six months or so, she would place an order with some wholesale supplier and fill that freezer with junk like liver, frozen Brussels sprouts, and liverwurst. My mother was a health food nut and I always wondered how she could have married my father, who refused to eat anything green. Anyway, one summer day, when the freezer's contents were down to a few packages of peas and carrots, my father and I went on a Good Humor hunt. When we corralled the truck underneath a bridge, Daddy looked at me, looked at the driver, and said "Follow us home, why don't you?" Our little caravan arrived at our house, where Daddy had the driver back the truck up to the chest freezer and unload the entire contents of the truck on top of the peas and carrots. The freezer was really full, but we managed to slam it shut after consuming a bit of the overflow. A few hours later, my mother came home and paid a visit to the freezer to procure some healthy delights for dinner. I am really sorry that nobody had a camera to preserve, for all eternity, the priceless look on her face when she flipped open the freezer. I have to say that my mother's personality ranged from merely cranky to intensely volcanic. She knew more curse words in more languages than anyone I have ever met, and trust me, Daddy and I heard all of them that afternoon. The two of us just plastered goofy smiles on our faces and let her vent. Daddy and I spent a lovely summer wandering around the garden consuming more ice cream bars than most people eat in ten years. No ice cream ever tasted as good as those Good Humors. Daddy died last Saturday. He was 88. 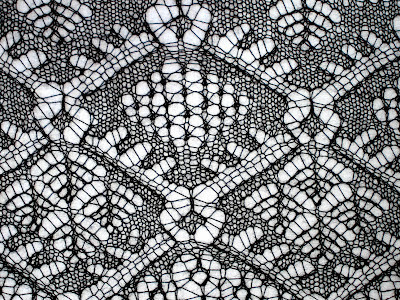 0: Able to knit complex lace for hours at a time. 1. Able to knit simple lace for an hour or two. 2. Can manage a yarnover here and there. 3. Able to knit stockinette with sparsely placed cables . 4. Able to knit some plain stockinette with frequent pauses. 5. Able to knit a few repeats of K2P2 ribbing. 6. Able to pick up knitting needles, but the flesh is too weak to actually knit anything. 7. Unable to pick up knitting needles, but still have a desire to do so. 8. Able to focus on knitting needles. 9. Able to focus on knitting needles and thinking about falling on them as a pain reliever. 10. Promises your entire stash to whomever can move the knitting needles closer so you can fall on them. Of course, if any of you have better descriptors, please bring them on. I could use a good laugh.